Having crossed the city of Limerick to another bus, in 40 minutes I finally reached the final destination of my trip - to a small town Ennis, and at the bus station I was met by a man for whom I came here - brother Liam O'Meara. The monastic in his guise, of course, was nothing - neither a morose, long-legged robe, nor wooden beads in his hands, nor a "circle" of cut hair ... An intelligent-looking man in glasses rather reminded me of his kind of teacher. I was not far from the truth - in my youth, Liam received a pedagogical education and worked as a teacher for a while, while the circumstances of his personal life did not force him to accept the monk's order and start another life. But is the other one? For a day and a half during our long conversations about everything absolutely, I came to the conviction that for this person everything in life could not have been differently formed, probably, the work of the teacher, if we consider this profession in its original and high educational value, and role of the upbringing of the younger generation, was reflected in everything he did, and most directly reflects the true purpose of the monastic vow that he gave, becoming one of the many in the Christian Brothers Order - a life for the sake of children. Ennis - charming, drowning in greenery and flowers, is at the crossroads of many roads in co. Clare, which played an important role in its prosperity - to the economic centers of western Ireland - the cities of Cork, Limerick, Shennon Airport, Galway, from here, as they say, a stone's throw away. I discovered here a lot of interesting facts in the history of the Catholic movement in Ireland and I must say that my new knowledge has crossed the previous ones obtained in Soviet history textbooks and partly helped to understand where the spirit of compassion from the Irish people is so strong - all this not only suffered for their history, but also not for one hundred years was brought up by the Catholic Church in people, as the only right way in life. Catholic faith today can not be separated from the life and culture of the Irish people, and the position of the church in the state and its ministers in the education system still occupies an important place. In the town of Ennis, since the 12th century, the Monks of the Franciscan Order built an abbey, which has survived to this day and is a national monument. Traveling monks, the Franciscans, were invited by the prosperous townspeople of Ennis to preach and maintain the Catholic faith and freedom-loving spirit among the people, and along with all the Irish they suffered many hardships and persecutions for the Catholic faith when the English captured the island. And in 1802 Edmond Rice - one of the wealthy citizens of the city of Wexford, who made money on commerce - founded the Christian Brothers Order, and that was the reason - after several years of English colonization, when it was forbidden to apply to the Catholic faith, to receive education in the Irish language and to indulge in this faith of children - in Ireland there are no well-educated people who could teach children in schools. Therefore, the main goal for the monks of the Order was the enlightenment of their people and the upbringing and education of the younger generation. The root of the word "educate", if we remember our Russian language, is one and in the word "to feed" - to "feed" young people with a kind word. And since then, "Christian Brothers" not only prayed for the prosperity of the homeland and its liberation from English oppression, but opened schools throughout Ireland and taught in them. The Christian Brothers also traveled around the world and stayed in foreign countries, building monasteries for the donations of local citizens and continued to bring enlightenment in European cities, New Zealand, Australia and America. Under the patronage of this order for many years were and are the primary & secondary schools in Ireland. The monk Liam O'Meara's co-operation in Belarus began after the Chernobyl disaster and continues today. But his work and the work of all the other Irish volunteers in this country, refers to unusual children born with various psycho-neurological abnormalities. I've seen many photos of disabled children in Lim's office, and I think that not everyone is allowed to work with such children ... in fact, the life dedicated to sick children is a civil feat. I quote from a book he wrote in 2003: "... We were told - do not go there unless you want to return with two heads, get cancer or leukemia. We were told - do not eat mushrooms and avoid berries, do not drink water and do not wash anywhere, but only in Minsk. But we could not stay away from this world. And we went there and discovered something important in ourselves and the need for our lives for these children. And this is what I am and what I believe in. And what I believe in is I. And we started this new work for helpless, special children. And these special children, who need help every minute, have taught us that there is love. " Gorodishchi and Lutovets, Chernobyl and Minsk ... and those ruined, abandoned villages, where there were only orphanages with sick and unnecessary children in the Soviet system. Pregnant women who were not immediately evacuated from the disaster zone, without warning about the possible consequences of radiation for a future child .. On request for help in the first arrival of a group of Irish, considering children confined to beds and as if buried alive, he told himself, "I do not I can deal with this ... I can not deal with this ... How can I do this? " But he came to Belarus and stayed in this unknown country for himself. "The Burren Chernobyl Project" appeared absolutely naturally shortly after his first trip to Belarus, when Lim brought the first sick children to those Irish families who were ready to accept them as their own. At the moment of our meeting he has just returned from Belarus and in the beginning of August flies again, he no longer needs a visa - an Irish monk from the Order of the Christian Brothers Liam O'Meara received in Belorussia a permanent residence permit and a letter from the Government of Belarus with gratitude for his Associate activity in shelters for disabled children. Taking me to the bus station, he was on the phone discussing visa problems for the rest of the volunteers. "Everything is as usual, the usual routine work with papers" - he smiled, he told me. 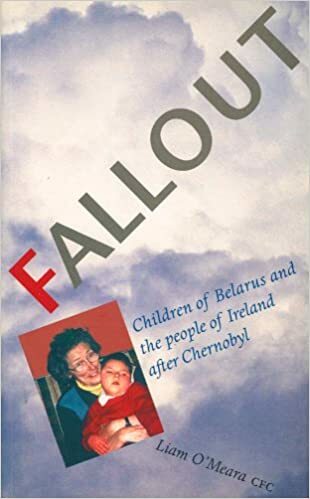 The first book of Liam is called "Fallout" and tells about the children of Belarus and about the people of Ireland after Chernobyl, who took up the sick children. From English this name can be translated in two ways - as "the radioactive sludge spilled on the country and people," and as a "sediment" in the soul ..
Let each of us after reading his book find his translation in this title.